Heat the Oil in a large pot (6 qt size) over Medium-High. Add the Onion. Stir frequently until softened. About 5 minutes. Stir in the Garlic and Jalapeno. Cook for about 45 seconds then por in the Chicken Stock, Hominy, Oregano and the cut up Chicken Breast. Increase the heat to High and bring to a boil. Once it reaches a boil reduce the heat to Medium and cover. Stirring occasionally. Allow to simmer for about 10 more minutes. Use some tongs to remove the chicken to a plate/bowl then use two forks to shred the Chicken into bite-sized pieces then return the Chicken to the Pot. Bring the Soup back to a simmer and stir in the Lime Juice and season to taste with Salt and Pepper. 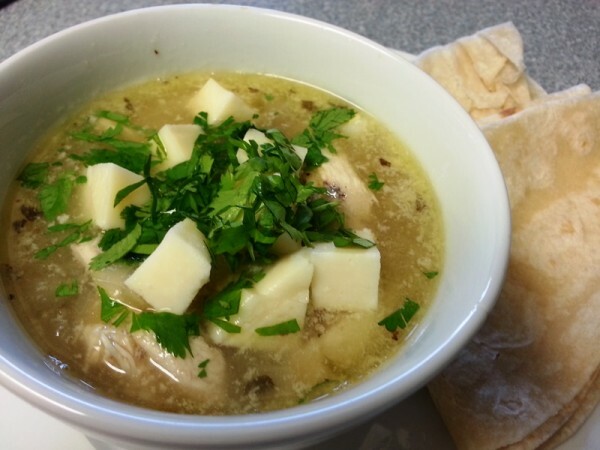 Ladel the Soup into Bowls with some cubes of Cheese and garnish with some chopped Cilantro.